Browse this interactive guide to discover how a Doctor of Physical Therapy can help you. The head and its structures play a key role in movement. The inner ear helps maintain your balance. Located right under the skin and activated by the facial nerve, facial expression muscles allow you to smile, lift an eyebrow, close your mouth as you eat, and close your eyelids tightly. The temporomandibular joint guides the jaw, allowing your mouth to open for speaking and chewing. The hand—palm, fingers, and thumb—consists of several small bones and joints that are specialized to allow intricate movements. Cylinder-shaped bones extend between the wrist and the finger bones. Each of the 4 fingers has 3 joints; the thumb has 2. The hand and fingers allow us to perform fine tasks, such as embroidery or using a keypad, as well as carrying and lifting objects. The wrist connects the hand and forearm. Several bones (carpals) are arranged in rows and come together with the forearm bones (radius and ulna). The carpals also connect with the bones (metacarpals) that form the palm, and the metacarpals connect with the finger bones (phalanges). The wrist is both mobile and strong, allowing you to do delicate work as well as grip and lift heavy objects. Carpal Tunnel Syndrome, Wrist Fracture, Wrist Tendinitis, Finger Fractures, Finger Strains, Thumb Strains, Tendonitis. The thoracic spine (upper back) and lumbar spine (low back) consist of 17 stacked vertebrae, with disks between them to absorb shocks. Nerves emerge from the spinal cord to “activate” parts of the body. The low back helps you stand upright and maintain balance as you bend over or lift heavy objects, while the upper back anchors the ribcage and protects the heart and lungs. Both areas are influenced by postures and activities in which we engage. Sitting for long periods (for work and driving) is often more stressful to the back than more physical activities. The ankle is located between your foot and leg. When it’s healthy, the ankle is an extremely stable joint. 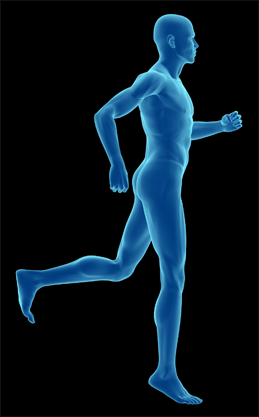 When you walk, it bears almost twice your body weight; when you run, it bears almost 8 times your body weight. The ankle and foot joints are complex to allow the foot to adapt to uneven surfaces as we walk. Muscles and ligments provide stability. Ankle Sprain, Ankle Instability (turning), Heel Pain, Plantar Fasciltis, Heel Spur, Bunion (pre or post-op), Walking/Running Pain. The hip joint is formed where the rounded head of the thigh bone—the femur—fits into a deep, cuplike socket (acetabulum) in the pelvis. Your hip joint assists in the support of your body weight during standing, squatting, walking, running, climbing, or jumping. With the “core” muscles of the back, abdomen, and thighs the hip is built to help you maintain balance and stability throughout these movements. Pain anywhere from the lower back to the legs encompasses the hips and may be involved in the complex interplay between the back and hip. Physical therapists are the experts best suited to intervening in problems of the hip/lower body. Snapping Hip Syndrome, Sprains, Strain, Fractures, Impingement, Bursitis, Iliotibial Band Syndrome, Piriformis Syndrome, Degenerative Joint Desease, Tendonitis, Sciatica. The elbow joint is where the humerus (upper arm), the ulna (inner forearm), and the radius (outer forearm) come together. The radius and the ulna work together to rotate your forearm, such as when you’re turning a doorknob. The biceps muscle is a major muscle that enables the elbow to act like a hinge between the upper arm and forearm. Elbow injuries are common among athletes. Nearly all hand and wrist movements rely on stability from the elbow. This makes problems felt in the elbow common across many age groups and activity levels. One of the largest joints, the knee is a “hinge” that allows bending and straightening. It consists of the bottom end of the thigh bone (femur), the top end of a leg bone (tibia), and kneecap (patella). A series of tendons, ligaments, and fluid-filled sacs called “bursae” help the joint move smoothly. The knee bears your body weight while you bend, squat, straighten, twist, and turn. Anterior Cruciate Ligament (ACL) Tear, Knee Pain, Meniscal Tear, Patellofemoral Pain, Total Knee Replacement, Arthritis, Tendonitis, Bursitis, Instability (giving away), Sprains/Strains. The neck, or cervical spine, has 7 bones (vertebrae) with gel-like, rubbery disks between each bone to absorb shock. The neck allows your head to move up and down and turn from side to side in many combinations. It contains part of the spinal cord and nerves that emerge from the spinal cord to “activate” the rest of the body. The neck is flexible and can be easily injured with sudden jolts. The neck is also prone to stress and strain from work or leisure activity. It is vulnerable to the postures we are all place in everyday. The neck is often involved in shoulder, TJM, and headache problems. Degenerative Disk and Joint Disease, Herniated Disk, Spinal Stenosis, “whiplash”, Strains, and Activities/Work Stress. One of the largest and most complex joints, the shoulder includes the clavicle (collarbone), scapula (shoulder blade), and humerus (upper-arm bone) and the ligaments and muscles that connect those bones. The humerus and the scapula fit together like a ball and socket. The shoulder allows a wide range of arm movement but also has to be stable enough that you can lift and pull heavy objects. Our shoulders are naturally somewhat unstable and prone to strain or posture related problems. Shoulder pain is often felt in the upper arm. It is also closely related and often involved in neck and upper back problems. Frozen Shoulder (Adhesive Capsulitis), Labral Tear, Rotator Cuff Tear/Strain, Shoulder Dislocation, Treatment After Surgery, Bursitis, Tendonitis, instability, and general shoulder pain. The largest organ in your body, the skin has 3 layers and covers 20 square feet. It protects your body from outside elements, helps control body temperature, and allows you to feel sensations. You might not think of skin when you think of movement, but scar tissue can prevent you from bending a joint, and a long period of time lying in bed without moving can result in painful sores.